She married Charles BOURN on 20 May 1852 at the St Michaels Church in Christchurch. Charles was baptised on 30 October 1829 in Oundle, Northamptonshire, England, died on 9 February 1907 in Riccarton, Christchurch and was buried on 12 February 1907 at the Timaru Cemetery in Timaru. The ship he arrived in New Zealand on, the Randolph, was the same ship that Amey came to New Zealand on. Charles was originaly a cabinet maker in Christchurch then had his own farm in Riccarton, Christchurch. He then purchased another farm in Burnham, then on to Southbridge, before purchasing a large property in Waimate as well as having another plot of land at Geraldine. In the early 1900's, Charles had retired and was living in Timaru. Several variations of names have been seen with this family. The first is the surname BOURN. In the process of research, a number of records and index's also have BOURNE. Also, for Amey's, while it is commonly accepted that it should be Amy, both her birth and baptismal certificates clearly have Amey. Amy Maria BOURN, born on 7 April 1853 in Riccarton, Christchurch and baptised on 22 May 1853 at St Mary's Church in Merivale, Christchurch and died about 1934 at the Hospital in Christchurch. She married Lawrence Hossack HERDMAN on 5 September 1876 at St James Church in Southbridge. They had three children. Elizabeth Ann "Eliza" BOURN was born on 14 June 1854 in Riccarton, Christchurch and was baptised on 6 August 1854 at St Michaels Church in Christchurch as Eliza Elizabeth Ann BOURN. She died on 16 July 1950 in Blenheim and is buried in the Omaka Cemetery in Blenheim. Eliza married Alfred Daniel LOE on 18 January 1877 at St James Church in Southbridge. They had five children. Charles William BOURN was born on 8 July 1855 in Riccarton, Christchurch and was baptised on 4 November 1855 at St Michael's Church in Christchurch. He died on 24 January 1919 in Christchurch and is buried in the Bromley Cemetery, Christchurch. Charles married Minnie E. WARMOLE about 1888 in New South Wales, Australia. They had two children. John Thomas BOURN was born on 11 November 1856 in Riccarton, Christchurch and was baptised on 17 January 1858 at St Peters Church in Riccarton, Christchurch. He died on 13 August 1924 in Timaru and was buried in the Timaru Cemetery on 16 August 1924. John married Caroline Ada "Carrie" EDWARDS on 9 August 1882 at St James Church in Southbridge. They had two children. Sarah Jane BOURN was born on 17 August 1858 in Riccarton and was baptised on 5 September 1858 at St Peters Church in Riccarton. She later became a nurse. George Alfred BOURN was born on 27 November 1859 at Riccarton and was baptised on 25 December 1859 at St Johns Anglican Church in Rangiora. He died on 30 October 1951 in Perth, Western Australia and was buried on 31 October 1951 in the Karrakatta Cemetery, Perth, Western Australia. 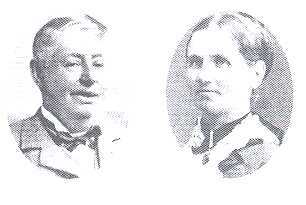 George married Ada Emily Mary GOODWIN on 29 December 1889 at the Wesleyan Church in Christchurch. They had one child. George then married Edith Emily OTTAWAY about 1903 in Broome, Western Australia and had another five children. Frederick Edward BOURN was born on 31 March 1862 in Riccarton, Christchurch and was baptised on 27 April 1862 at St Peters Church in Riccarton, Christchurch. He died on 21 June 1932 in Timaru and was buried in the Timaru Cemetery the same day. Frederick married Mary SHARP on 7 May 1885 at St Johns Anglican Church in Rangiora. They had three children. Horton Smart BOURN was born on 9 January 1864 in Riccarton, Christchurch and was baptised on 28 February 1864 at St Peters Church in Riccarton Christchurch. He died on 28 May 1918 in Christchurch and is buried in the Linwood Cemetery in Christchurch. Henry BOURN was born about May 1866 in Christchurch and died about Aug 1866 in Christchurch. He was buried in the Burnham Cemetery near Christchurch on 5 August 1866. Ida Emily BOURN was born on 25 May 1867 in Christchurch and was baptised on 23 June 1867 at the Anglican All Saints Church in Burnham near Christchurch. She married Thomas George SHARPIN on 17 October 1895 at St Johns Glebe in Sydney, New South Wales, Australia. Arthur Henry BOURN was born on 28 January 1869 in Christchurch and was baptised at the Anglican All Saints Church in Burnham near Christchurch on 6 June 1869. He died on 17 December 1918 in Christchurch and is buried in the Linwood Cemetery in Christchurch. Arthur married Edith Withers BOWIE about 1898 and they had two children. Frank Piercey BOURN was born on 9 November 1870 in Christchurch and was baptised at the Anglican All Saints Church in Burnham, near Christchurch. He died on 13 June 1900 while serving with the New Zealand army in the Boer Wars in Johannesburg in South Africa as a result of a fever and is buried in the Pretoria Cemetery in South Africa. One record states that he died of Enteric Fever, and was buried on 15 June 1900 in the hospital section of the Braamfontein Cemetery in Johannesburg. Herbert Louis BOURN was bourn on 6 August 1872 in Ellesmere, near Christchurch and was baptised at the St James Church in Southbridge on 29 September 1872. Caroline Alice BOURN was born on 24 April 1874 at Ellesmere and was baptised at the St James Church in Southbridge on 5 July 1874. She died about 1962 in Christchurch. Minnie Louisa BOURN was born on 15 May 1877 in Ashburton and was baptised on 8 July 1877 at St James Church in Southbridge and died about 1963 in Christchurch. She married Rev Percy REVELL on 3 June 1920. They had three children. Walter Lionel BOURN was born on 4 July 1877 at Ellesmere and was baptised on 18 August 1878 at St James Church in Southbridge. He died about 1961 in Fairlie. Walter married Edith Hannah HAGGERTY on 4 July 1899. They had two children. Edith Gertrude BOURN was born on 24 June 1882 in Christchurch and died on 24 July 1957 in Christchurch. She married Percy Coleman ROBERTS on 17 June 1920 in Timaru. They had two children.